When Are Anger Room Beneficial? There is a time and place for everything, the saying goes, and now there ’s a place to go when you’re so angry you’d just love to hurl a vase. 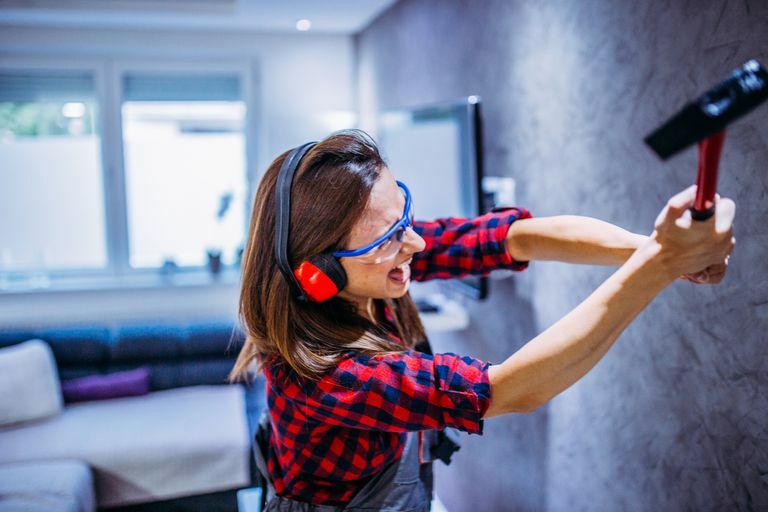 While “escape rooms” are growing in popularity as an outlet for creative problem solving, “anger rooms” are popping up all over to offer an outlet for frustration. They are meant to be a place to break things when you’re angry, consequence-free (or so it would appear). In an anger room, you have the opportunity to destroy something without having to feel bad about it or even clean up afterward. “The Wrecking Club” in New York, for example, is billed as a place “where people come to smash stuff to pieces.” “The Break Room” near Atlanta, GA, and “The Anger Room” in Los Angeles, CA, offer similar experiences, as do many such clubs around the country that are growing in popularity and receiving rave reviews. These rooms are set up with breakable items for patrons to smash for a few minutes at a time. Blowing off steam makes many people feel better at the moment, but are these rooms healthy stress management strategies or effective for anger management in the long run? How do they compare to simply hitting a pillow or going to the gym to blow off steam? There isn’t yet much specific research on whether these anger rooms can benefit you by lowering stress levels or increasing anger management skills; these places are relatively new. However, the idea behind them has been around for quite a while—who among us has never been so angry that we just want to break something? Because of this, there are some existing studies that can give us some clues about whether these rooms do more harm than good. Some research suggests that breaking things may not be the best way to handle anger. The catharsis theory of aggression maintains that if people are able to vent their frustration and anger, this anger will decrease. This theory has been around for decades, but research debunking it has been around for almost as long. One study that was conducted in 1959 gave some subjects the opportunity to hit nails with hammers for ten minutes to decrease their anger levels after being insulted, while other subjects were left to wait the ten minutes without physical activity to help them vent their anger. The results showed that the hammer-wielding subjects were actually angrier after ten minutes than those who were sitting quietly, even though the catharsis theory would lead us to expect the opposite. Another study from 1969 allowed students to leave negative evaluations of a teacher who (unbeknownst to them) was being purposely frustrating, while other subjects who had experienced the same frustrations weren’t given the chance to express their anger and aggression with negative evaluations. Again, contrary to expectations, those who had vented their anger were actually more angry afterward—not less. Interestingly, there is even research on whether aggression is increased by venting when people believe that venting will minimize their anger. (In other words, there is research that has tested whether the idea that venting anger as a way to manage it is a self-fulfilling prophecy that will lead to reduced anger because people expect it to work this way.) The short answer is that it doesn’t work this way; venting anger by punching a punching bag still increased anger levels in subjects who were lead to believe that this type of venting would decrease their anger. Perhaps more alarming, the 1999 study that found this also detected an increased likelihood that these angry people would take their hostility out on innocent bystanders if given the chance. One study related to this theory found that people who acted aggressively after being provoked and experienced a decrease in anger afterward were more likely to be aggressive on days when they were angry in the future. However, those who experienced an increase in anger after expressing aggression had no increased tendencies to act out their aggression on days when they were especially angry. It is interesting to note that not everyone in this study experienced a decrease in anger when they acted out their aggression. A related study found that those who evaluated the source of their anger tended to experience a decrease in anger as a result. Those who evaluated something else that was unrelated to their frustration experienced no significant changes to their anger levels. This is interesting because it suggests that analyzing why we are angry can more reliably help us to decrease our feelings of anger, while acting out our anger appears to increase it, either in the short term or in the long term, as the previous study demonstrated. In addition to evaluating the source of frustration, research has also found that some other forms of stress management may be more effective than taking our aggressions on inanimate objects. For example, research finds that taking a break (remember the old admonition of counting to ten when angry? ), practicing breathing exercises, and trying meditation (even if you’ve never practiced meditation before) can all decrease your levels of frustration and anger. Even better, they all do so without the negative consequences of increased aggression later. Progressive muscle relaxation: Take some time to tense each muscle in your body and then consciously relax them to help calm soothe yourself physically. Cognitive restructuring: This means shifting your perspective to a less angry one by thinking of things differently. Social skills training or assertiveness training: This form of behavior therapy teaches you to relate to others in a healthier way so you can avoid becoming as angry and stressed. Problem-solving: Not all problems can be easily fixed, but many can. Becoming more proactive when possible can help you to minimize stressors in your life. Exposure to the stressor: This is recommended for many issues including anxiety, and involves facing something that causes you to stress, in small but increasing doses until you feel less stressed and more able to cope with the stressor. Education about anger and anger management: Learning more about anger and how to have a healthy relationship with your own anger can minimize the need for a place to blow off steam, and can help you to keep yourself from taking out your anger on others. Stress management: Being proactive with stress management can help you to build resilience so you don't feel as stressed by new things that affect you in your life. There are many effective ways to manage stress! This begs the question—if venting our anger by breaking things may help many of us feel like we’ve decreased our anger, isn’t it a useful activity to try when we’re at our wit’s end? Or even a worthy activity for a Saturday night out with friends, particularly if we’re a group that would like to vent our anger and to blow off some steam? Doesn’t this research miss the point that these rooms are all in good fun? To try something new: If you’re curious about these places you may want to try them out to satisfy your curiosity! It can be an interesting form of exercise. It can give you a funny story to share with your friends. It can also be a fun activity to bring them along to, which leads to the next point. For bonding: If you’re going with a group of friends, it may be a bonding experience to break things together. If you go with your partner or a friend who is experiencing the same stress you are, this can also be a fun way to blow off steam and connect. Just be aware that this can increase your likelihood of being aggressive, and make it a point to develop habits that will help you to manage your anger in other ways as well (such as those listed above). Bresin, Konrad; Gordon, Kathryn. Aggression as Affect Regulation: Extending Catharsis Theory to Evaluate Aggression and Experiential Anger in the Laboratory and Daily Life. Journal of Social & Clinical Psychology. 2013; 32(4):400-423. Bushman, B. J., Baumeister, R. F., & Stack, A. D. Catharsis, aggression, and persuasive influence: Self-fulfilling or self-defeating prophecies. Journal of Personality and Social Psychology. 1999; 76: 367-376. Homberger, R.H. The differential reduction of aggressive responses as a function of interpolated activities. American Psychologist. 1959; 14, 354. Lohr, Jeffrey M.; Olatunji, Bunmi; Baumeister, Roy; Bushman, Brad J. The Psychology of Anger Venting and Empirically Supported Alternatives That Do No Harm. Scientific Review of Mental Health Practice. 2007 5(1): 53-64. Does Complaining About Work Relieve Stress or Create It?